Sky Cries Mary - "Taking the Stage"
Vocalist Roderick Wolgamott first performed and recorded under the name Sky Cries Mary in the late 1980's. This early incarnation of the band performed a sort of dark industrial goth rock. With the split up of that group, Wolgamott decided to take a new direction in sound. Hooking up with DJ Fallout and operatically trained vocalist Anisa Romero (who would later become his wife) amongst others, the band started to create a sound that explored the nether regions between psychedelia and goth and space rock. One time AI writer Keith Henderson called them "One of the most innovative (of the) 90's space merchants", proclaiming their 1993 album Return to the Inner Experience one of the quintessential albums in any space rock collection. The band arguably peaked with '94's evocative and exciting album This Timeless Turning. 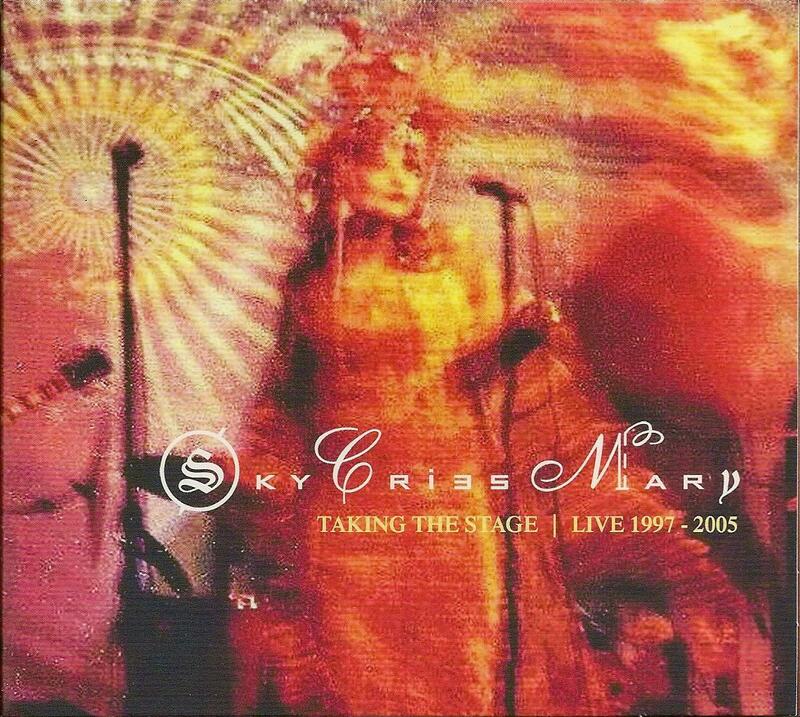 After a stint with a major label that didn't work out too well, membership changes, and an extended hiatus in the early 2000's, Roderick and Anisa are still performing and recording under the name Sky Cries Mary. This latest release, as the name suggests, is a compilation of live recordings from between 1997 and 2005 (a period that included their hiatus, but is after all save one of their studio releases). Many of these recordings were previously available on the now out of print 2005 live album Here and Now, but here they've been remastered and three newly released tracks have been added, including the title track and Rain, two recordings from 1997. Playing live, the band emphasizes the space rock side of their sound by creating open, spacious versions of their songs, allowing members room to improvise. This can be immediately heard on the opening, title cut, which draws you in with its deep space drones, freaky electronics and groovy rhythms, before melting into the Floydian space blues of Rain. Roderick and Anisa's vocal harmonies are amongst the most unique and distinctive in rock music. And when Anisa sings solo, she can pull off sultry and dramatic with equal aplomb. In fact, one of the highlights for me is the superb version of Don't Forget the Sky (originally from This Timeless Turning), which combines both to haunting effect. Other highlights include the energetic and pulsing Walla Walla/Moving Like Water, the hauntingly beautiful Gliding and the spacey, electronica influenced Remember Me the Wind. The only misstep, I felt, was the inclusion of the previously unreleased studio cut California Dreaming, tacked on at the end. It's a rather dreary and dark goth version of the Mamas & the Papas classic that didn't really do anything for me. But other than that, this is a top-notch live collection that fans will love, but it's also a great place to start if you're unfamiliar with the band.